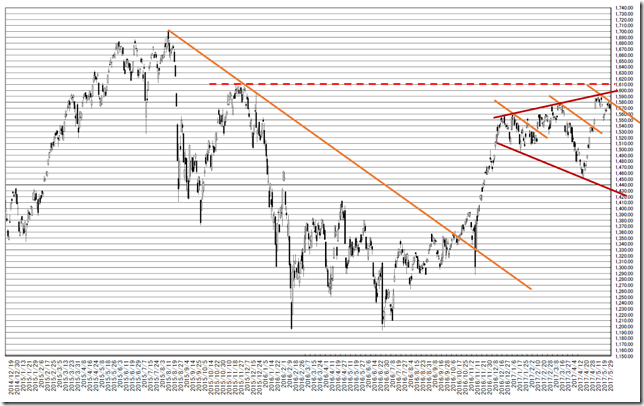 Dollar based NIKKEI 225 mid-to-long term; Yen will be stronger but the price will reach 210 dollar around. 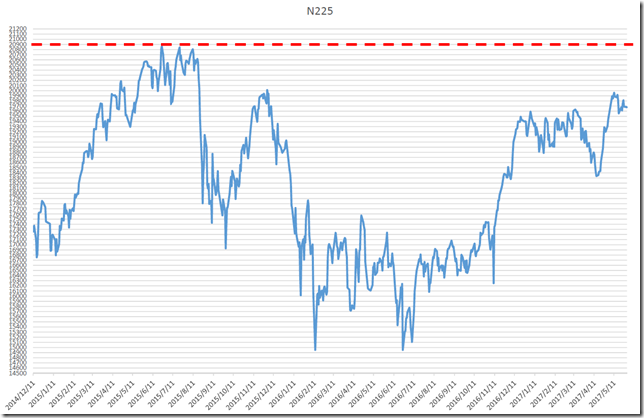 Today is about Dollar based NIKKEI 225 long term. Our conclusion is “N225 is Teflon market for foreigners”. We reported “Now is uneasy market condition but chart provides only truth. Foreigners must be bullish!” in 3/30/2017. We reported “Dollar based NIKKEI 225 long term; historically major resistance points are 170 and 210 dollar around; major support is 80 point around” in 11/19/2017. This market cut the historically resistance (170 dollar) and the next target is 210 dollar around. The price challenge 160 dollar high in many times and we can confirm stability. We reported “USDJPY Weekly P&F; only sharply falling in lower than 110yen, it seems to be buying opportunity” in 4/2/2017. We reported “USDJPY mid-to-long term; following past price movement, the price will recover 110-111yen around” in 4/19/2017. The latest market has big gaps and the major trend is taking a rest but we are basically bearish. Now, this is only “mental gymnastics”. We are bearish in USDJPY market and this view is still valid. 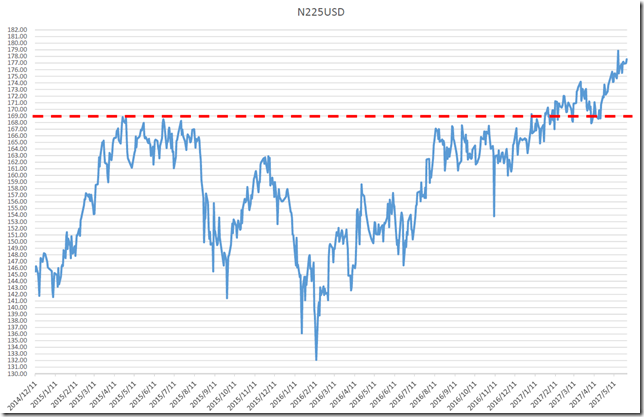 We can conduct “Dollar based NIKKEI 225 seems to be stable”. 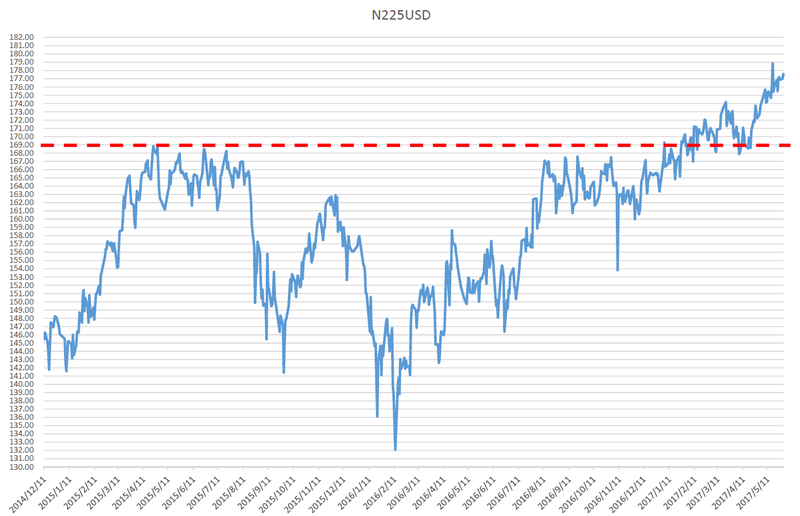 And we make a combination table of N225 and USDJPY. Imaging 210 dollar of Dollar based NIKKEI 225, this means USDJPY will be 100yen and N225 will be 21000yen or USDJPY will be 70yen and N225 will be 14700yen. And 170 dollar seems to work as strong support. 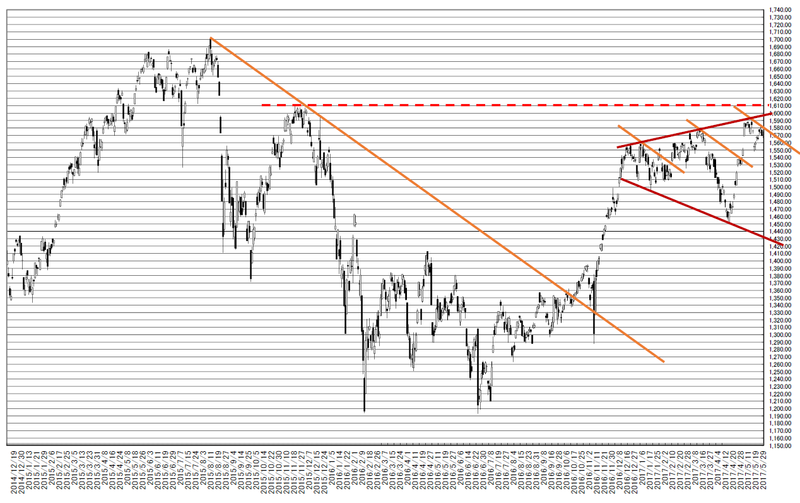 TOPIX daily; 1610-1600 point is close but difficult to reach. 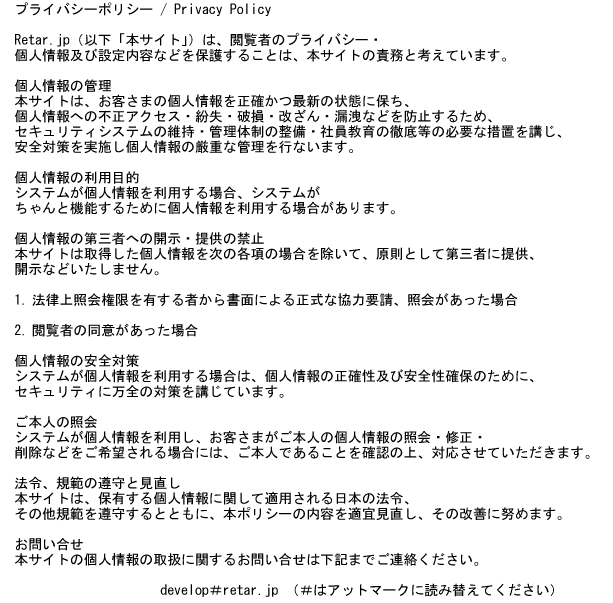 Today we analyze TOPIX daily. 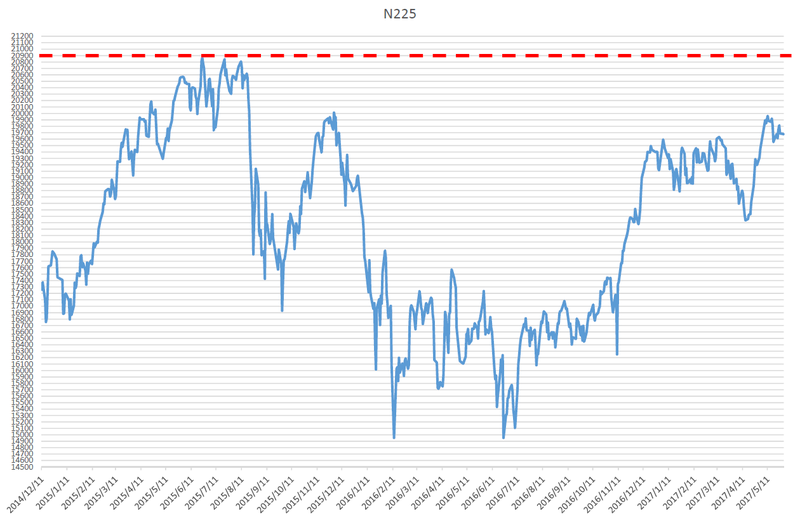 Our conclusion is “20000yen over in N225 seems to be difficult and 1600 point over in TOPIX is also difficult”. Referring our report in 5/9/2017, relatively strong Japanese Yen, the latest TOPIX is too high. We plot TOPIX and N225 after 2000. 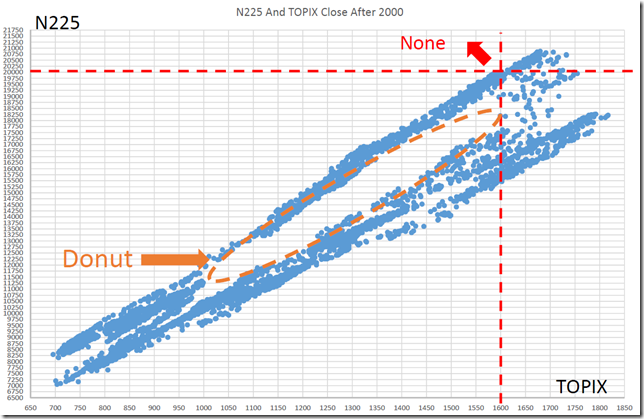 And there were no cases, 20000yen over in N225 and 1600 point lower in TOPIX. We can conclude 1610 point is close but difficult to reach.